The answer, as suggested by Kurt Johannessen in the artist talk, is situated between ‘know’ and ‘not-know’, or to be more precise, in the constant movement between knowing and not-knowing. Performance, as a form based on presence and with the ambition of being present, has to be sensitive and conscious of what constitutes given now. It has to continuously question its definition which changes with time, terms and conditions. “Performance uses performer’s body to pose a question about the inability to secure the relation between subjectivity and the body per se; performance uses the body to frame the lack of Being promised by and through the body – that which cannot appear without a supplement.” (Peggy Phelan, Unmarked: The politics of performance, Routledge, New York 1993, s. 151-142). And the supplement is in an incessant flux. Performance art born in the time of social, political and cultural revolution of the 60s, was accepted as a medium of the artistic expression at the end of the 70s (Roselee Goldberg) causing before that time a mystical conundrum for the art writers. A moment in the art history when the conceptual art dominated praising idea over product, was perfect to establish a form happening only once, impossible to repeat, existing in ephemerality and yet with very strong expression and message. What was even more important, and at the same time often overlooked by the critical discourse; performance meant not only introducing presence into the place occupied by the art object but also pushed the audience to be present, focused and united in one space and time in the act of experiencing art. During more than 50 years of its history, performance went through many different phases. While at the beginning the emphasis was put on the performer's body – its meaning and subjectivity (Amelia Jones), later the body still played an important role, however, with the changing social and cultural contexts other elements gain significance; place, used objects, interaction with the audience, media, technology etc. 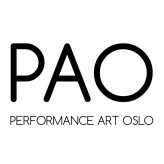 I started with a few words on the history because the sixth edition of Performance Art Oslo festival was happening under the slogan Parallel Times - Performance Now creating a dialogue between the younger generation of performers and artists already active since the 70s onwards. Performance Art Oslo (PAO) consisted of the curated program which involved artist talks, live performances and the video program. In the frame of PAO, there were also shown live performances - final presentations from Performance Art Studies (PAS). Tanja Thorjussen and Franzisca Siegrist – curators of PAO Festival 2018 focused on various forms of influences on this specific form of art. What constitutes now for the contemporary performance? If I would have to describe with one word only this year edition, I would probably write – a matter, a materiality. The materiality of performance art was accented on various levels evoking its visual roots – sculpture, painting and drawing. A metal-frame object like from the children's playground was placed in the centre of the gallery space. 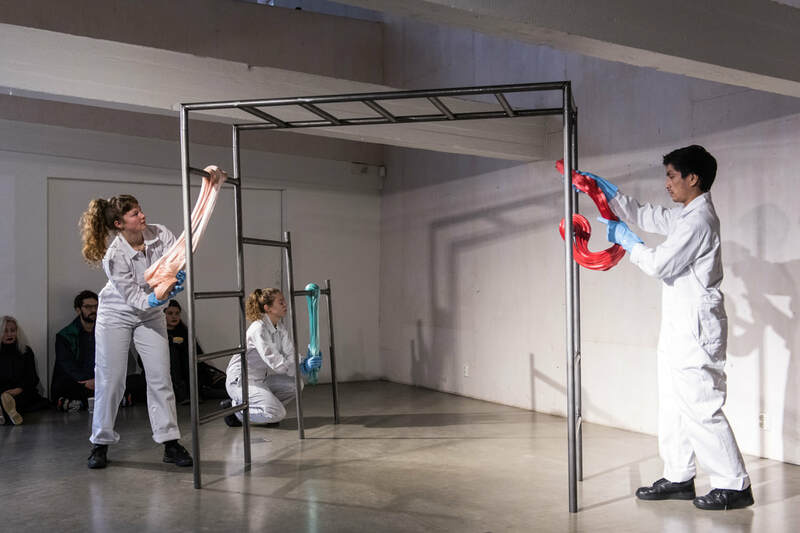 The collective of 3 performers in white suits approached the construction with candy-like jelly color substances in their hands and started to wrap it around (Vilde Løwenborg Blom performed with Sara Guldmyr & Finn Adrian Jorkjen). They had to move fast as the runny material did not want to stay too long at the rigid frame. After a while of observing this Sisyphean task, it seemed like the performance would never end. However, a careful observer could notice that with time the substance hardened and gradually, a swiftness of artists movements changed into the use of force. When finally the consistency of the material created a stable construction the sculptors could leave the space – all tired and sweaty. The idea of this processual work was at the same time simple and powerful. In a way, a similar process one could observe in a ‘wrestling painting’ by Kachun Lay performed with Daniel Pedersen –a professional wrestler. This time the centre of the gallery space was occupied by the ring – a red square on which two performers covered in white paint were actually fighting. Each time their bodies were falling on or touching the red canvas surface, the painting was gradually created – reminding of the Pollockian Performative gesture. The materiality was also literarily mentioned in the video program; Megan Toye in her curatorial statement accompanying movies from the Franklin Furnace Archive in New York wrote, that the screening came out of her interest in magnetic tape. Looking from the perspective of a contemporary viewer who got used to the smoothness and sharpness of the screen surface with its bright color palette, there is some kind of materiality in the imperfect frames, these dirty video pictures from the 80s and 90s – I’m thinking here of the technical details. And in terms of that particular point of view, one thing was particularly interesting to notice. All presented performances at the festival– regardless of the age of the performers, were happening in the reality in which development of technology surprisingly does not exist; there was no single performance using so-called media. Almost as if the parallel times were taken literary and one could easily imagine all presented works back in the 80s – at last from the technological point of view. If one looks at the content, it seems like the concept of engagement has changed enormously. Is it because, as PAO states: performance art is always created in relation to the present and in dialogue to the place and time, is the present so different? In the video Extreme Woman (1987) Iris Rose says that “demonstration involves more than just yelling, and that protest is when I say I don't agree with this and that”. At the end of her political troubling litany: “the bombing in Vietnam, the terror in Iran, the torture in South Africa” – Rose ends in the same breath: “but remember about double standards”. Some critics would say that the atmosphere of the early performances (60s, 70s, and 80s) with its unique political and social engagement is impossible to be repeated nowadays. But aren’t there always issues and problems to be engaged in if one is attentive enough or chooses to be an active observer of the reality? Maybe the contemporary performance is not any more a relevant form to talk about current problems like backlash of woman’s rights, climate change etc.? Or – from the other side – what form should it take if it has such an ambitious aim? I leave these questions open. Some of the current issues were possible to trace in the works of Irma Optimist. In her artist talk, which was connected with the critical reflection on the condition of the planet and masculinity (interesting combination). She presented – in a bit ironic way – a detailed mathematical proof that the population indicator of the living planet index dropped significantly. Irma’s performance was related with the refugee's crisis made in the set up of a few objects: Old overhead projector showing the picture of the globe, big blue yarn, roses, and a small blackboard. In the accompanying video with the sea sound at the background, Irma was writing single words at the blackboard and then carefully wiping them off to make a place for the new ones: stowaways, without papers, frozen to death. It was enough to get the message. But of course, politics or engagement doesn’t need to be shown directly – sometimes the subtle messages are less noticeable, but can still be powerful. I have already mentioned fight painting; and this focus on painting and drawing was possible to trace in many other elements of the festival program. First of all the festival was documented in the drawing notes made by Irene León and Miguel Panadero, which was a very fresh and interesting idea giving the audience another perspective to look at the things which were just presented. Drawing lines were part of the Hilmar Fredriksen piece (an earlier work reenacted). Alastair MacLennan performed the ritual of parallel black paintings – always created simultaneously; the last symbolic pair created only as a hand gesture left the space for the imagination of the viewer. A drawing gesture in the air could be found also in the performance of Manuel Lopez which focused more on a body and presence – or – as he wrote on the window steam he created from the outside: here and now. Andrea van Gelder (PAS) also created space for the painting with a bit unusual material and rhythm; moving in a peculiar skater costume attempted to paint with the use of whipped cream and a watering pot. Are gestures enough? What about the words? In the video, Stockholm art fair – Marilyn (2004) Kjartan Slettemark – the key figure in the PAO Festival 2018 video program, is blessing the audience repeating the same text in various languages as a tour guide. This understanding of a language when the content is less important than the form also appeared in the presented works. Hilmar Fredriksen was showing to the audience different boards with letters and each of them was accompanying with the relevant vocalizations – his performance reminded of the Dada phonetic poems. There was the reverse order as well; in the performance of Ann Noël, it is the letter of the alphabet that sparks off a word, a gesture and an anecdote. Her performance had a very clear structure: she was drawing lots with letters of the alphabet, showing the chosen one to the public, and then either telling a short anecdote, story, joke or presenting a short performance. Her stage presence had something of a magician in it; there were a magic hat, the playing cards, multiple magic objects, and the tricks, the miracles – stories of everyday life experiences subtly relating to the personal stories. 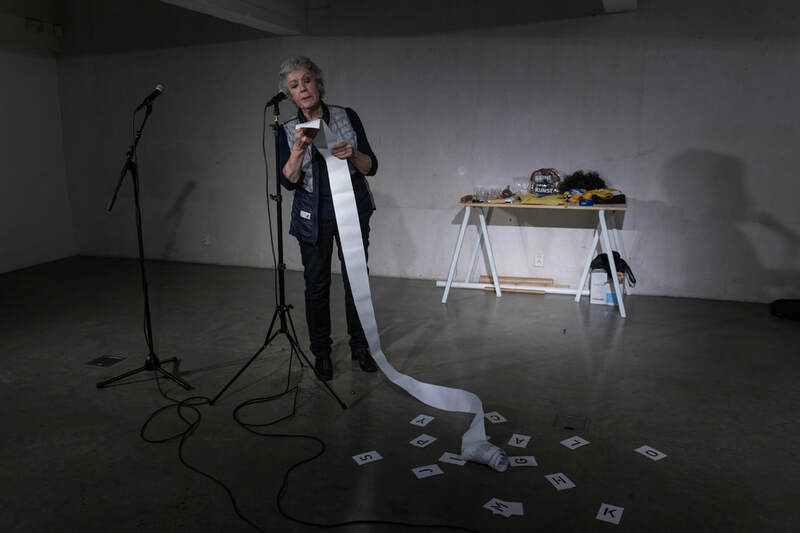 And then there was a language in itself – In her artist talk Lisa Tostmann read her notes, questions and reflections on contemporary performance to the audience, in her performance she was silent, almost. And almost is also the key word here. Tostmann started her performance by attaching two squeaking toy pigs to her feet. As she started to walk the pigs were whistling with every step. She got under one of the horizontal pillars and started to jump. With each jump, she was almost touching – if not almost smashing – her head against the pillar. This paradoxical combination of a funny noise and a risky movement provoked specific attention to her body – head in particular. Was it a deconstruction of contemporary thinking? Or just playing with the attention of the viewer? Emily Promise Allison used in her work two loudspeakers giving specific sounds to which she was responding. Watching Allison’s dance performance I felt like putting together my own story as if it was possible to create the image-narration based on sounds and movement suggestions. Was it a bit similar to the idea of l’audio-vision (Michel Chion)? And there was more from dance movements in the live performances of PAS participants. A kind of Butoh dance appeared in the performance of Gabriela MB with a package of cigarettes. Yağmur Taçar and Daniel Novick made an almost acrobatic combination of close-distant lovers on the roofpillars of the room. There were examples of carefully prepared costume design (Hanne B. Nystrøm appeared in a unique white-box outfit), disturbing set-ups (Marion Horney was playing the Swedish anthem on a piece of meat like on the violin), and quieter personal stories which required attention and silence (Ingrid In der Maur presented an honest personal talk) There were also pieces engaging the public; Yendini Yoo Cappelen asked selected individuals for help to hold her plate with clothespins, which she was attaching to her face. Coming from this point I would like to pay more attention to the collective or common experience in the performance. During PAO festival 2018 there was a very special reunion of Hilmar Fredriksen, Kurt Johannessen and Kjetil Skøien performing individually and yet at the same time together – the last time they performed together was before 1993. Their meeting was probably one of the most important elements of the festival. The power of this reunion came from – talking in Deleuzian terms – la difference; the same, which is not the same. The artists were reenacting their works from the past, which allowed the audience to see through the lens of contemporary perception the accumulated layers of time. What has changed? What was the same? In one of the works artist-trio were liberating themselves from the carton-boxes – from what, towards where and why? Looking at them I thought about distance in time O Gadji Beri Bimba performed by Hugo Hugo Ball and changing concepts and practicalities of everyday life and art. I’m returning back here to my reflection from the beginning of the article on being present and the presence of performance art. 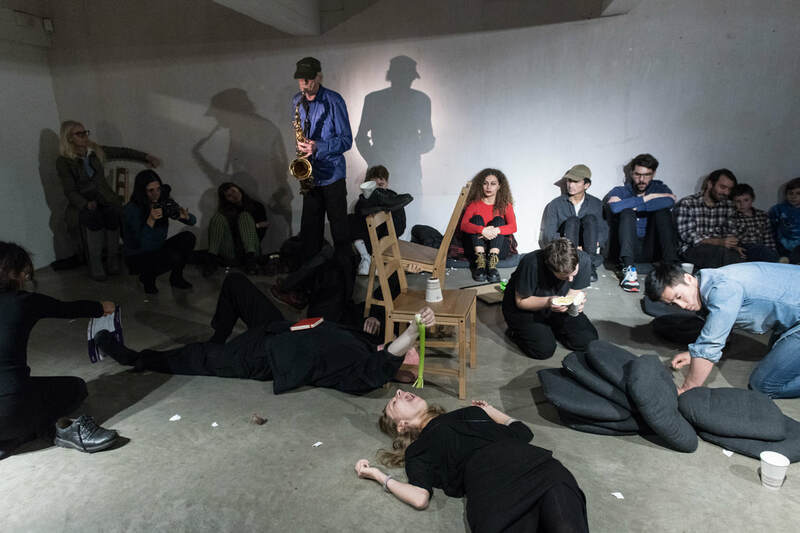 The last piece of the PAO festival 2018 – an improvised jam session performed by Helge Nicolai Bjørkø, led to a very spontaneous and a bit out of control participation of the audience. Actually not the audience – but the community. After an intense three days of watching, discussing, eating and experiencing together, what happened was that closer connections and interactions came into being. And perhaps that is the most important thing about this form, or perhaps any form of art – the meeting, the exchange, and the experience. In the times of rush, a dying planet, virtuality, fake news, neoliberal instability, alienation and you name it, the meeting becomes a real revolution. Wasn’t that always what performance is about?